Boulders Beach near Simon’s Town has a lot going for it: the ancient granite boulders protect it from the wind and large waves, making it an ideal swimming spot for kids. The beach is always clean and safe, because it falls under the Table Mountain National Park Marine Protected Area. It is rarely crowded, and kids will be delighted by the stunning rockpools. But the soft white sand and warm(ish) waters are not the only reasons why 60,000 visitors a year make their way along the coast, past Simon’s Town, to Boulders Beach. The local inhabitants—African penguins in their thousands—know how to pull the crowds. Want to save money on sightseeing? Get hold of a City Pass for generous discounts on Cape Town’s top attractions. African Penguins used to be known as jackass penguins because of their distinctive braying, and they’re the only penguins found on the continent. Colonies can be found from southern Namibia all the way around the South African coast to Port Elizabeth, but few places offer as remarkable a viewing point as Boulders Beach. The penguins first came to False Bay in 1983 from Dyer Island, which is near Gansbaai. Back then, there was plenty for them to eat and the colony grew rapidly. Sadly, commercial fishing, marine pollution, and habitat destruction have taken their toll on the colony. 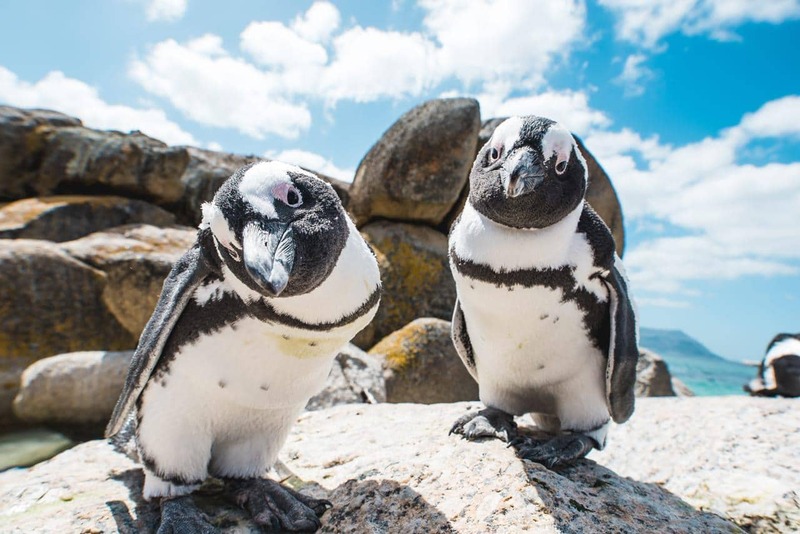 In 1910, it was estimated that there were approximately one-and-a-half million African Penguins; a century later, the aquatic bird was classified as an endangered species. By 1982 there were only two breeding pairs remaining. Incredible conservation efforts have grown the Boulders colony to over 3,000 birds in recent years. Boulders Beach is a great spot to set up camp for the day, but it isn’t actually the best area for viewing the penguins. For this, there are three wheelchair-friendly boardwalks that make their way through the dunes and dense vegetation around Foxy Beach. If you want to get up close and personal with the penguins, make your way to Foxy Beach. Just don’t get too close—–those beaks are razor sharp! At the Boulders Visitors Centre, you’ll find information about the penguins and knowledgeable guides. Summer is prime time to visit Boulders, and its when you’ll see the most penguin action. However, you can see the penguins throughout the year. Between September and October the birds spend much time feeding out at sea, so there are fewer penguins on the beach. For a real treat, visit in January when the juvenile birds are moulting on the beach. If you’re after snapshots, visit early in the morning or late in the afternoon when the birds are most active. There is a small conservation fee charged to access the beach. Adults pay R76 per day and children pay R41 per day.